In August 2015 I was fortunate in being able to meet Elizabeth to hear of her war service. Elizabeth was born in Darlington on August 27 1926. Her father, Theodore Fenwick Hedley died in March 1929. Within five months her mother moved to the little village of Rotherwick near Hook in Hampshire with Elizabeth and her siblings Patricia and John. In August 1944 Elizabeth volunteered to join the WAAFS a year before she would have been called up and did her basic training at Wilmslow. 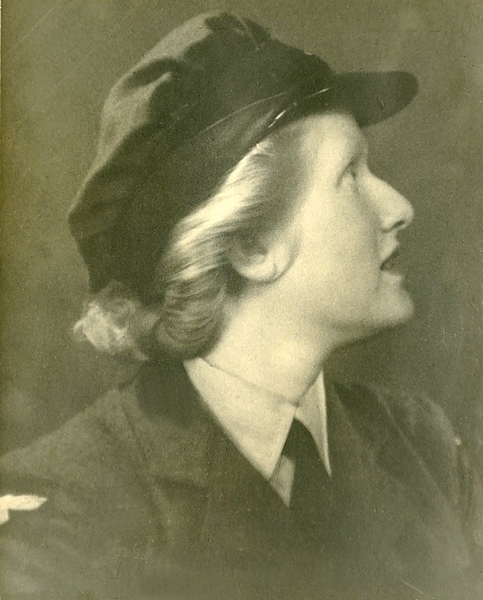 Her sister Patricia was already a WAAF Radar Operator so Elizabeth requested to become one too. Of course she had no idea what it meant as radar was one of the best kept secrets in the war. Her training for this was carried out at Cranwell, following which she had a limited choice of postings. She chose the Isle of Wight because her sister was at Beer in Devon! Well at least they were both in the south of England. At The Needles she was employed operating the Coastal Watching Chain Home Low radar, the range of which was limited to the horizon. Before D Day the emphasis was on looking for any large vessel heading towards the north of the Island. This was because there was a fear of the enemy trying to bottle up the huge number of waiting vessels in the Solent by sinking block ships. Elizabeth arrived on the Island in the September and was billeted with Ron Drake and his family at a house called "Cotswold" a short way up The Avenue from the Memorial Hall. The WAAFS were driven each day up to the Needles in the back of a 15cwt small lorry. One day, returning to the Island, she missed the last train from Lymington to the ferry. The ferry was told to wait for 'This ere WAAF' who was to be on duty at 23.00 hours, the ferry waited while Elizabeth was allowed to run down the track! On VE Day. May 8th 1945 Elizabeth, while at home on leave received a telegram telling her that the Needles Radar was being closed down so she had a few extra days leave. She was then posted to RAF Ventnor. There she lived in the Down Lane domestic site and once again operated the Chain Home Low radar located in the same compound as the CH kit on top of St. Boniface Down, but this time plotting aircraft rather than shipping. The following paragraph tells us about something that I believe is largely undocumented. When the war ended the WAAF hierarchy decided that as many of the girls had never experienced civilian employment before joining the service they would benefit greatly by receiving Educational Vocational Training (EVT) to prepare them for life outside the service. Elizabeth came into this category and was sent to Weston Zoyland where she joined a course on carpentry thinking it might be useful. It did not last long. She had already applied for and been accepted to teach Domestic Science, being in possession of a diploma acquired whilst at school from the GTCDS. Gloucester, which somewhat qualified her for this. Thus she went up to Preston for an instructors' course, and on passing out she skipped four levels of promotion by being elevated to the rank of Sergeant. A posting to Blake Hall, near Epping followed. There they only wanted to make use of her dressmaking skills and this permitted her to making "wonderful forays into London to buy coupon-less material." Elizabeth was introduced to playing snooker in the Sergeants' Mess. She was quite a sporting girl it seems, already playing squash and at one time representing Reading in this. Rather enigmatically Elizabeth tells us that she once played cricket at Edgbaston in 1949 and also tennis at Bletchley. When her mother became ill, although still serving, Elizabeth was allowed to live with her at Ascot and she was there when her demob. came through in 1947. Elizabeth met her husband, Richard at Reading but they soon dropped out! Leaving England on July 19th. 1950 they undertook a long cycling tour with tent and billycan. While waiting for a ship to Ceylon from Marseille they cycled on to Venice and Rome and back. They ended up in New Zealand and during the ten years they were there their three sons, Keith, Nigel and Simon were born. Richard was missing England with its long literary history so they sailed home and the Isle of Wight was the obvious place to live. The Clarendon Bookshop in Shanklin and Winchfield Gardens market garden in Newchurch followed. Then 30 years in Brighstone with their organic garden. They became founder members of the Farringford Tennyson Society and Richard was the first President. His ashes, scattered on their 42nd anniversary, September 17th 1991 are by the Tennyson Monument. Elizabeth worked very successfully for 15 years for Social Services, winning an award with her colleagues for the Home Sitting Service supporting carers. Elizabeth now spends her time editing her numerous diaries with the intention of publication. These have now been published (September 2017) as a paper-back entitled ' A Young WAAF Hitchhikers Guide to England.' telling us of 61 hikes carried out by her in the years 1945 to 1957. Richard's and Elizabeth's books are available. Elizabeth's other great interest is in sundials. 14.12.18 Sad news received today : Elizabeth died peacefully earlier this week. She was aged 92. RIP Elizabeth.